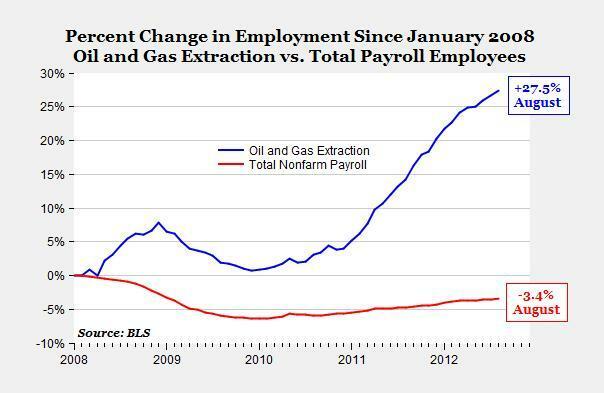 Growth in production of shale oil and shale gas is already having an impact on US employment, as seen in the graph below. If not for the economic growth in the US oil & gas sector, US unemployment would be well above 10% and the dismal state of the US economy would guarantee Obama's fate as a one-term president. But shale happened, and everything has changed. And the change has just begun. Separate studies released in the last week by two respected Canadian firms, one of Western Canadian shale gas resources and another of the U.S. shale gas base have moved the tally of North American potential to a new plateau, beyond the trillions (Tcf) to 3.3 quadrillion cubic feet (Qcf), according to reports by Natural Gas Intelligence (NGI). Calgary-based Sproule Associates, the oldest and still one of the biggest Canadian petroleum engineering and geology consulting firms, last week announced its survey of just five of 50 shale basins that have been identified in Western Canada produced a resource base estimate of between 809 and 2,222 Tcf or 2.2 Qcf. That is likely to be an underestimate, since much of Canada and the US -- including Alaska -- was not considered. More to come. Speaking of "more," the EIA graphic below illustrates the near term projected growth of shale oil production in Texas and North Dakota alone. 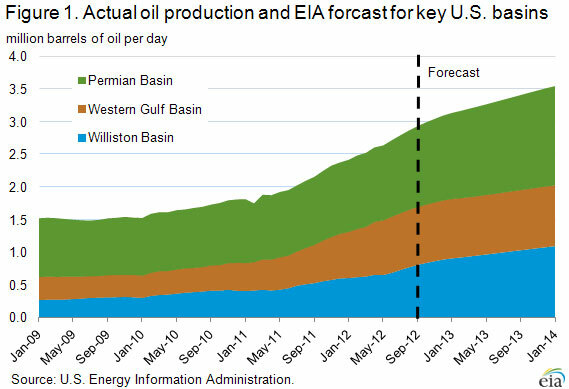 Ten years ago, the EIA could not envision this type of rapid production growth, and yet suddenly, there it is. All of this growth in North American oil & gas is occurring despite the Obama administration's intentional policy of energy starvation, as manifested by offshore drilling bans and moratoriums, closing off of federal lands to energy production, and business killing regulations out the as...trozone. Peak oil doomers have predicted the early demise of shale production, but the reality is proving otherwise. Rune Likvern [in The Oil Drum], has a bearish view of Bakken production. He believes Bakken production is close to hitting a plateau. Mr. Likvern's conclusions are incorrect. Well costs are improving in the Bakken, and will continue to do so through 2012. As innovation continues to pile on top of innovation, shale operators are learning squeeze more out of every well. As production methods grow more efficient and profitable, more jobs are added to the overall economy. While the Obama administration has been lavishing billions of dollars on politically connected big wind and big solar developers and investors -- many of which went promptly belly-up -- the real action in energy has been in areas far from Washington. The Obama EPA has been biding its time, waiting until after the election before taking steps to regulate the profits out of the shale motherlode. Even if Obama's energy starvationist regime is defeated in the US November elections, the EPA will have time to enact regulations which pack a ruinous punch against North American energy production -- including shale. We can only hope that the green bureaucratic ideologues ensconced within Obama's EPA will re-consider their plan of action.